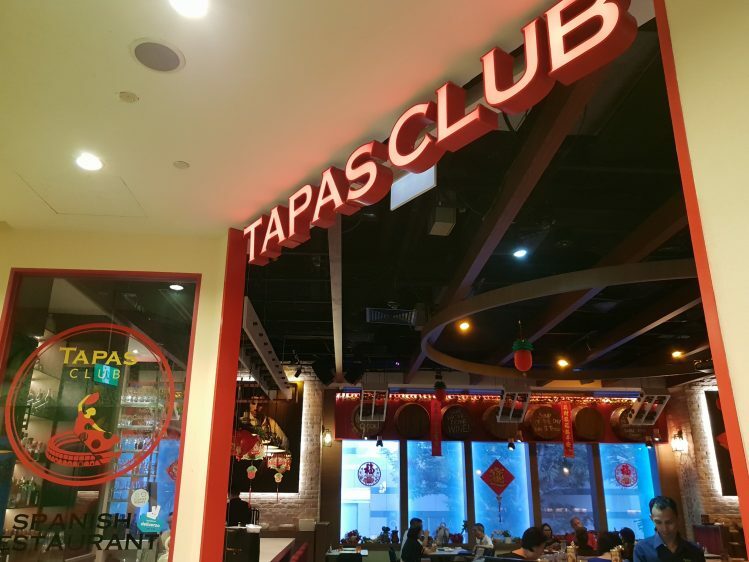 Tapas Club (Orchard Central) – Keeping it Real! Tapas Club at Orchard Central is one of those restaurants that I’ve let slip through my fingers. Only because of my love affair with what I believe to be the best Spanish in Singapore, Binomio. My reasoning is illogical, since Tapas Club was created by the Executive Chef at Binomio, Jose Angel Alonso, after all. And I do recall a couple of years back being told by the affable manager at Binomio that Chef Alonso was working on a new project, and yet, somehow I had not made my way there till now. I suppose I have Netflix to thank for that. Watching The Final Table, and realizing that one of the elite chefs who was competing for a seat amongst luminaries such as Andoni Aduriz, Grant Achatz and Yoshihiro Narisawa was a certain Manuel Berganza who listed Singapore’s Tapas Club as his credential, made me sit up in a hurry and plan my visit. It was on the second day of the Lunar New Year when hubby and I decided to visit. Hence the auspicious Chinese New Year décor you’ll see in my picture below – no paper pineapples hanging from the ceiling on a regular night, I’m sure. Paying respect to the occasion and the Year of the Pig, they were also serving out some festive dishes such as the Spanish suckling pig, but as we were hell bent on paella, we decided to skip that and try a couple of lighter tapas instead. 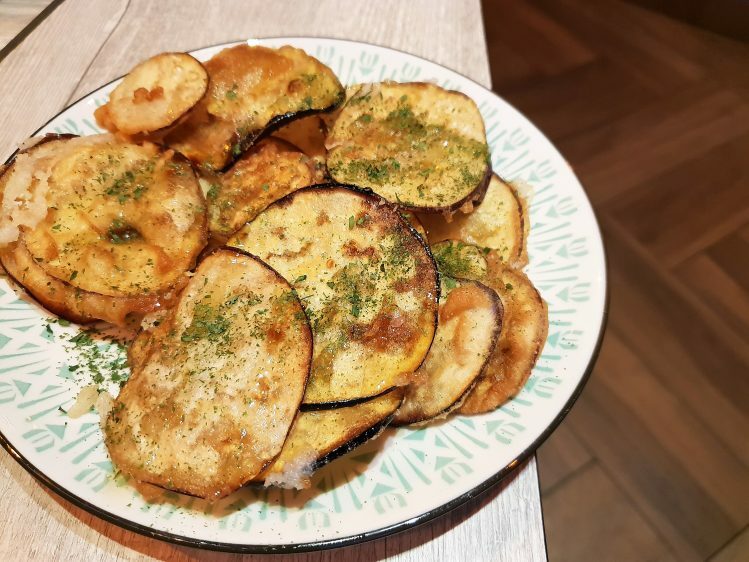 Having had enough of croquettas and padron peppers, we wanted something really different and so we ordered the Eggplant Chips with Honey ($9.90). No regrets! Wonderful as an accompaniment to your aperitif of choice, I am almost inspired to make this at home. Thin slices of eggplant, lightly dusted with flour, deep-fried and coated with sticky, sweet honey. The next dish, yes, we have had our fair share of chorizo on toast, but Tapas Club’s version is different. 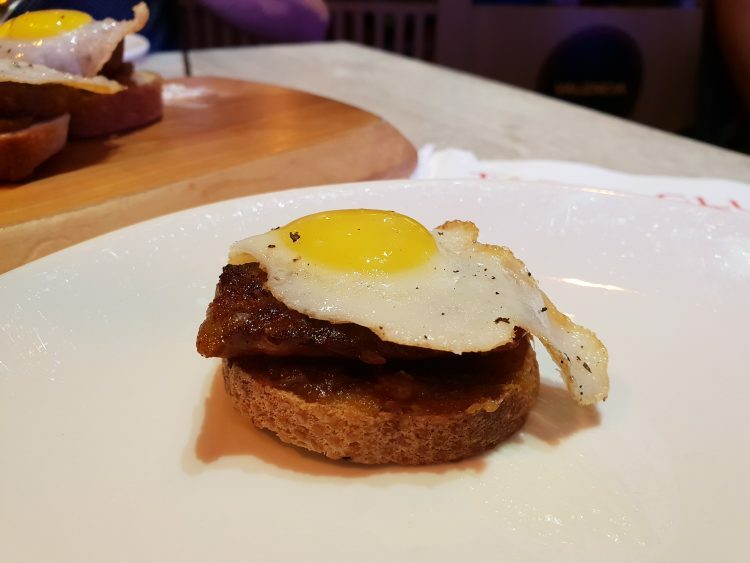 It’s the Chorizo and Quail’s Egg on Toast ($13.90), and I must say that I really appreciated the doneness of the egg. Looked like the yellow might burst all over the toast, but thankfully, no. It was yielding, but didn’t quite flood the rest of my dish. Who is the best paella of all? We had specifically gone to Tapas Club for paella, and we chose the Squid-ink Paella ($26). 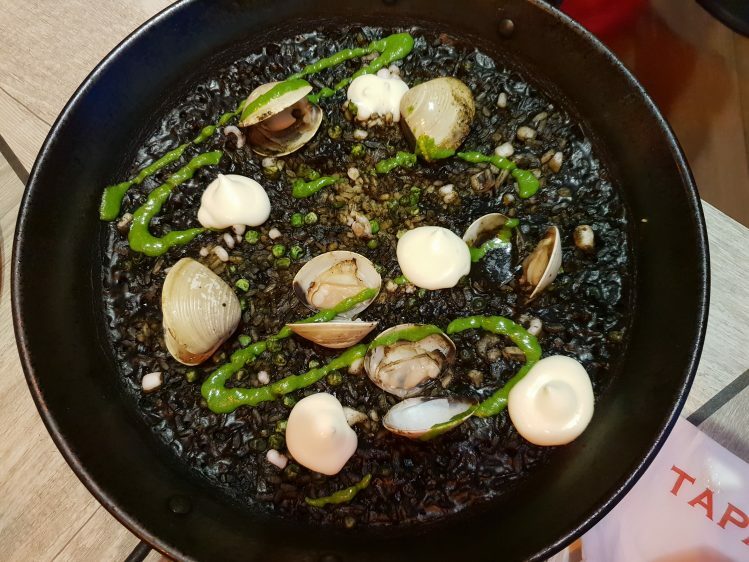 Now, my go-to for squid-ink paella is Binomio. That is one of the best I have had, ever. The socarrat (crispy base layer of rice) is perfect and the rice is not too mushy. The flavours of the paella at the Tapas Club were fine, there were dollops of aioli to add more creaminess to the already luscious rice. Just wish it had that socarrat base. I valiantly scraped the bottom of the pan, but ended up tasting the burnt flavour a lot more than enjoying a kiss of char on crispy rice. And finally, the Churros ($9). 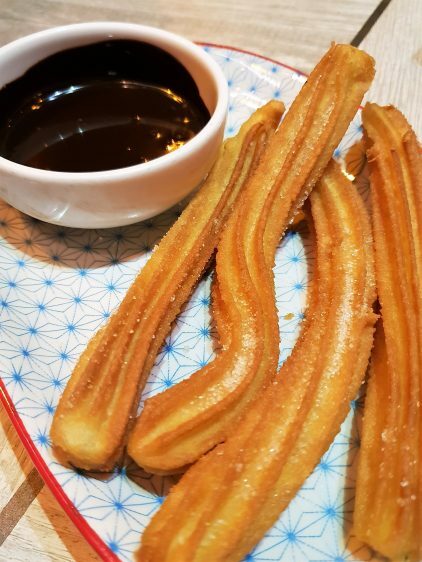 It was good, just how churros should be. And the little pot of thick chocolate to dunk the fritters in was just right too. Don’t judge the menu by its design! Now, I must admit, I had let my slight snobbery get in the way initially. I have this thing about picture-based menus (somehow Japanese restaurants are excluded from this judgment), especially those with top shots of each and every dish. Just makes it all seem rather fast food-ish and amateurish. So when I googled the menu pre-booking, and saw exactly the above, it took me another 2 weeks to muster up the desire to visit. But now, I realise I was being ridiculous again. And I learned something new. 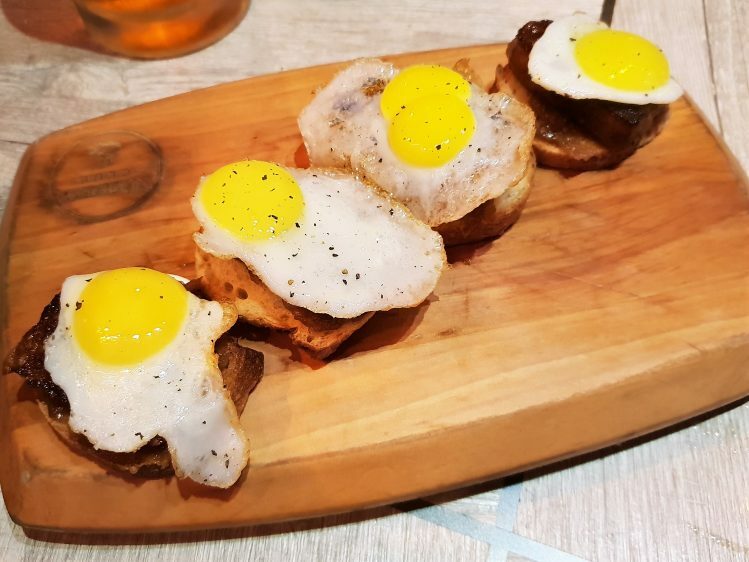 Chefs Alonso and Bergenza wanted to showcase the cuisine of their country without it being (as quoted from the website) “lost in a deconstructed haze of foam” and indeed, the sincere and down-to-earth experience one will get while dining at the Tapas Club meets this aim. So yes, a slap on the wrist for judging the restaurant by its menu design! It is, as my very sagely hubby put it, “unpretentious, casual Spanish food, a great introduction especially to people who might not be familiar with the cuisine”. Ok then, ‘nuff said.